To answer your question, yes a sprite is 8x8 or 8x16, and it uses one palette of a transparent color + 3 colors. It can also be positioned anywhere on the screen, and 64 of them can be displayed at any time. What exactly got you confused about what a sprite is? The thing is your image was kind of confusing, and for a not too complicated character. So it didn't really need different sprites just to show the skin color for example. For that particular character design, it's probably best to do it the way I described, unless some specific resource necessity calls for a shift in resource usage priority ("resources" being palette usage, CHR usage or sprite usage, for example). Although people would probably not use free assets "as they are", it's going to look better if the assets are designed with some degree of optimization for the desired platform. In this case I feel that 4 CHR tiles, drawn using 6 sprites with 2 palettes is a good way to go. Some of your examples use 6 CHR tiles, and/or 10 sprites, and/or 3 palettes. It shows exactly everything that is not a background, and how they are positioned on the screen. It's a nice way to see what are sprites. Yes mr nesrocks, you are quite right, and you image you posted first with my sprites is exactly how I would do it for a chr file. I have a software that will remove duplications and images that are mirrored. Optimising it as you say. No one might use the assets, but il make them anyway as its part of making my assets more universal. They are released public domain anyway so they could be used and edited, modified in whatever way the user wanted, so may be useful just for a demo or conceptual works. I really appreciate your last post, il check that software out as I haven't experimented with that one yet. Also what I will do is post the image again of the character with the chr set up. To answer part of your confusion, there are kind of two parts to displaying sprites. There's the sprite itself, which is always 8x8 or 8x16. Then there's the set of sprite tiles which are used to display sprites. If you use 8x8 sprites, each sprite uses 1 8x8 sprite tile. If you use 8x16 sprites, each sprite uses 2 adjacent 8x8 sprite tiles. But even using those two 8x8 tiles, it still only counts as 1 sprite. So in theory, with 8x16 sprites you can cover twice as many pixels of the screen as you can with 8x8 sprites. what our your thoughts on this tile set i'm working on?, the idea is it covers Sidescrollers, like, Platformers, Shoot em up, Beat em up genres of video games. The black grid of the tool is distracting. Any way you could post it without the grid? sorry,didnt realise i left that on. Now the scaling is distracting Why isn't it 1:1 or 1:2 ? Scaling? the first screenshot with the grid is an 8x8 grid, the other image is the same without the grid, im not sure what you mean by scaling 1/1 or 1/2, its just a screenshot of my workings so far, , maybe the sprite colours heading is off putting as this isn't sprites, its a background, so they are background tiles. although not formed in a NES chr set up(i can do if asked/required). id love to hear about the scaling you mentioned, if it helps me create more realistic/genuine looking NES assets. The image you uploaded is 951 by 610 pixels. What was the original size of the image before you enlarged it? The answer to that question would suggest more useful ways to enlarge the image for display. He meant that the scaling is uneven. The image is scaled up, but some NES pixels are 1 screen pixel wide/tall while others are 2, and it really hurts the dithering effects and the overall shapes of things, not good for judging at all. I don't know what tool you're using, but be sure to set the zoom to 100% or 200% when capturing images, otherwise the image will look distorted. The uneven scaling produces the errors, as tokumaru pointed out. Take a pixel perfect screenshot with zoom to 100% or 200% or 300%, etc. (n x 100)%, and the problem will go away. Oh I see!, the image is distorted, my apologies.il upload another, looked ok my end. Il make sure it all fits within the grids, some are loose and scattered about as its a wip.il tidy it up a bit. thanks. 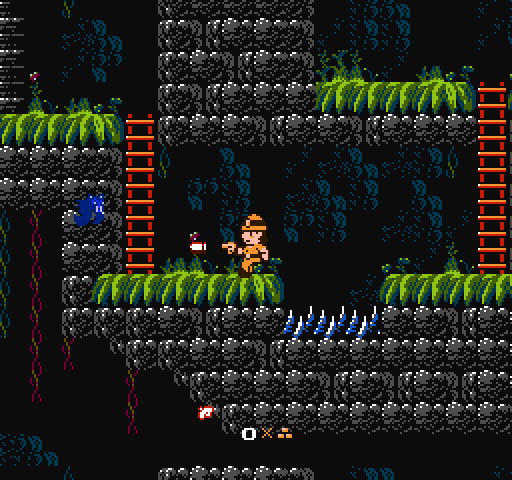 OK here is another screen shot, its just the platformer type tiles. original is 256 x 240, and then upscaled x4 1024 x 960. hope thats better to see now. Since this is an outdoor scene, the gray color seems a bit unnatural. Consider other options. If the idea is a stone wall, then redesign its pattern. Edit... since green is in the palette with the gray, consider some random green dots / dithering on the gray to make some moss or vines, would make it seem more natural. Also consider some cracks or defects. "Since this is an outdoor scene, the gray color seems a bit unnatural. Consider other options. If the idea is a stone wall, then redesign its pattern." your quite right there and i agree with you, but over the coming year i'm planning on lots of different variations of sets, which will feature a more rock design look and better themed, at the moment this is the only one i have designed which is going to be used as a template for now whilst i get my head around the colour and background limitations. There will also be orthographic, isometric versions and differences to a side scrolling game, such as 'beat em up's and the 'platformer' you see here. So if i can get the templates set up as i want i'm hoping this will make it easier in the long term, and i can focus on the enviromental themes better. That's great!, thanks for that, i did wonder about those, proportions to a character size may be an issue, but i can tinker with that nearer the time. "Edit... since green is in the palette with the gray, consider some random green dots / dithering on the gray to make some moss or vines, would make it seem more natural." 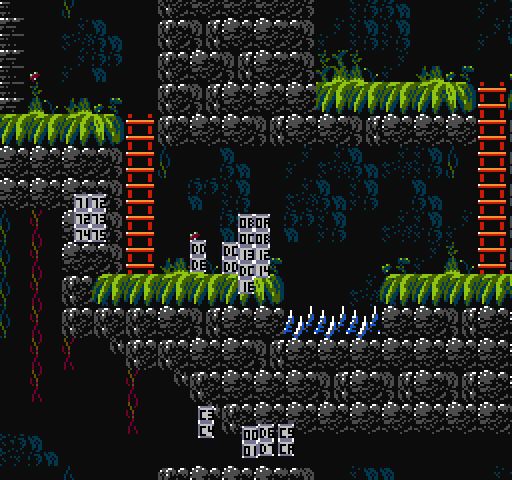 Yep, i do have tiles with vines, add a different climbing aspect then just the ladder. "Also consider some cracks or defects." Oh yes, school boy error there, that should break up the monotony a bit. I appreciate the feedback so thank you for taking the time to look at it, i'm pleased that there was no mention of colour mistakes, or that i had produced something the NES couldn't actually do, colour wise. think i'm getting the hang of this now.